Mayhem has been untethered this summer at the Getty Villa. Cowbells, pratfalls, unscripted asides, acrobatics and music embellish a sliver of a plot in Haunted House Party, a Roman comedy loosely based on Plautus’ Mostellaria (or Haunted House), now on the Getty’s outdoor stage through October 1. It has been six years since Getty audiences have enjoyed a comedy, and considering the generally fretful times we live in, this is a most welcome respite. As with all the Getty presentations, historical context helps to place this play in theater history and demonstrate how timeless it is. Mostellaria was written around 200 B.C., during or after the Second Punic War, when Hannibal had crossed the Alps into Italy. Rome was a military power and unlike Greece, not predisposed to cultural pur- suits, except for the religious festivals intended to propitiate the gods; and where public entertainment, including comedic plays, were presented. The Villa’s play, Haunted House Party, is based on a Greek model and set in Athens. The actors, all slaves most likely captured from the war, played stock characters that audiences would have recognized. Because no public permanent theaters were allowed in Rome at the time, these were itinerant troupes whose rag-tag players were only as successful as they were pleasing to the audiences. They talked directly to the audience of varied social classes, feeding them on with spur-of-the-moment slapstick and bawdy jokes. To bring all this to the contemporary audience is a challenge eagerly met by the Troubadour Theater Company, under the direction of Matt Walker. The Troubies evoke the idea of a traveling company, arriving in town with all their tricks and props in a sort of circus cart. The cart becomes an integral part of the otherwise minimal set on the Villa stage. As the players poured onto the stage, Getty Museum Director Tim Potts tried his best to preserve decorum, while the actors playfully teased him, twittering among themselves and gently hectoring him. Other actors mingled with audience members while others flexed their skillful bodies in acrobatic tricks. The plot, in a nutshell, features a sort of Risky Business trope. When the father, Callidamates, is out of town on business, his son, Philolaches, throws a bacchanal, borrows a large sum of money to buy the slave girl he loves, and is caught short when he learns of his father’s premature return. But luckily at the last minute, the conniving slave Tranio uses his inventive schemes to save the day. As with all Roman comedies, all’s well that ends well. Walker and the Troubies treat the work like a sitcom and their genius is adapting pop songs to be germane to the story. The finale does come, but not without myriad and hilarious “interruptions.” The players take time to josh with an audience member who arrives late. When Tranio is ordered to buy up all the prostitutes in town, he’s cautioned not to forget that one, pointing to someone in the audience. For all the tomfoolery, the success of the play relies on this superb company. The Troubadour Theater Company members are all exceptional theater professionals, skilled in acting, music, comedy and physicality. 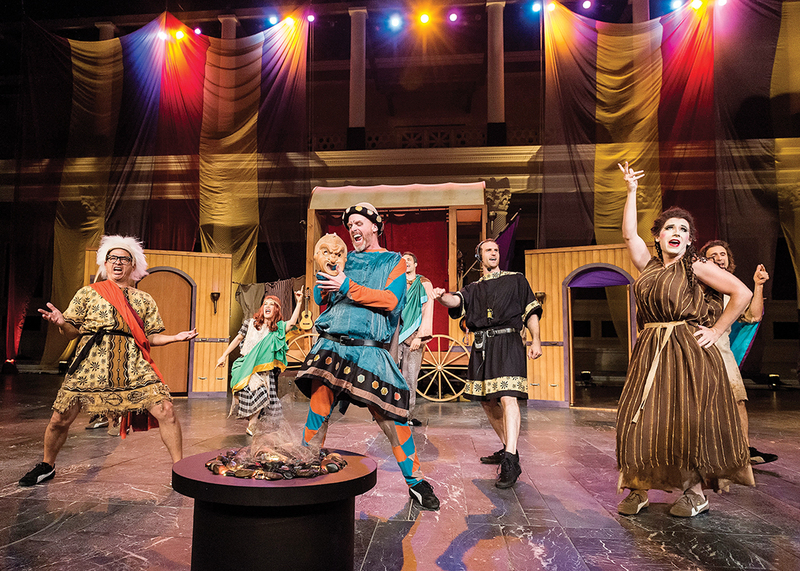 Known for their adaptations of classic and modern content, they previously presented Oedipus the King, Mama (with music from Elvis) and “ABBAmemnon” (with music from ABBA) for the Villa’s Theater Lab. The Troubies’ presentation of Haunted House Party is their first in the Villa’s outdoor theatre. 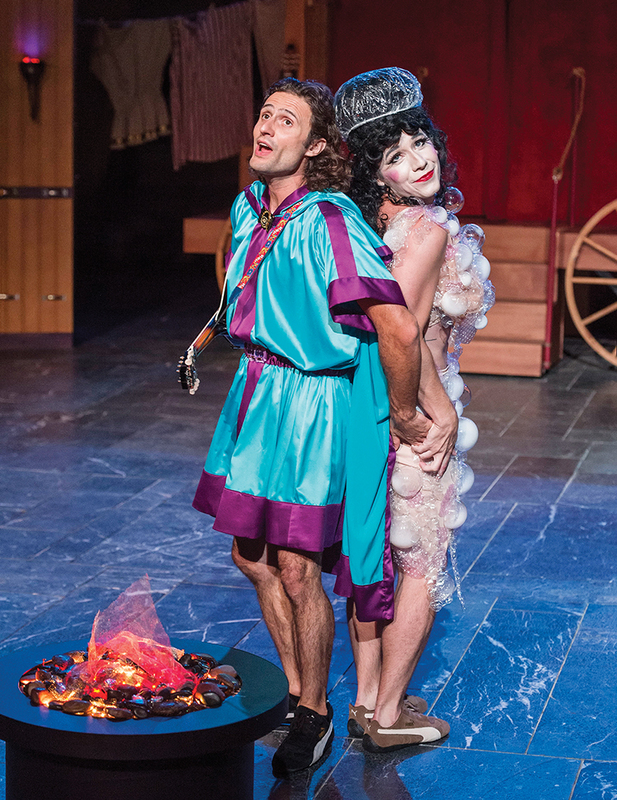 Performances continue Thursdays through Saturdays, 8 p.m. at the Getty Villa Outdoor Classical Theater. For tickets, call (310) 440-7300 or visit getty.edu/museum/programs/performances/outdoor_ theater_16.html.